Five Romantic Moments (When I wish I wasn’t alone!) – Where's Clair? So Valentine’s Day is looming. It’s fair to say that I have had a bit of a Love/Hate relationship with the day of love! As a teenager my first boyfriend dumped a few days before the big day. Fast forward 8 years when my long term partner gave me a card that said “To my Fiancée” only to clear it up after that he wasn’t in fact proposing, that was just the last card in the shop!! An absolute epic fail that I now see the funny side of! I again found myself single and in a way learned how to love myself and do nice things for me. 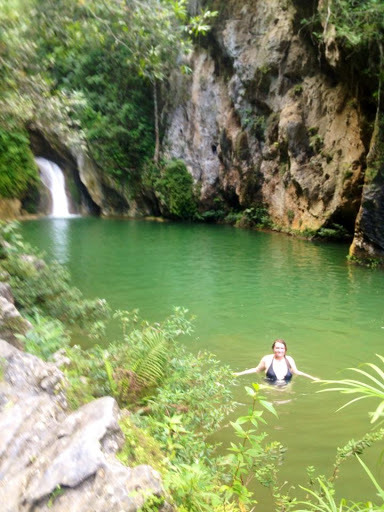 One of those things was travelling and I found myself flying solo to many amazing places. Now I love travelling on my own, I really do, but there are just some moments that you will experience that you really wish that you had someone to share it with. 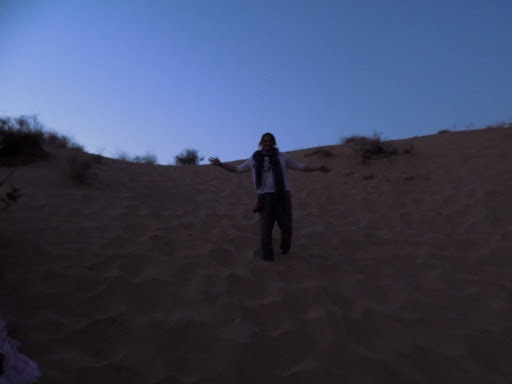 So since its Valentine’s I have decided to write about five romantic moments on the road where I wished I wasn’t alone! Ok so I wasn’t technically alone on the island, but I did spend large amounts of time on my own here. 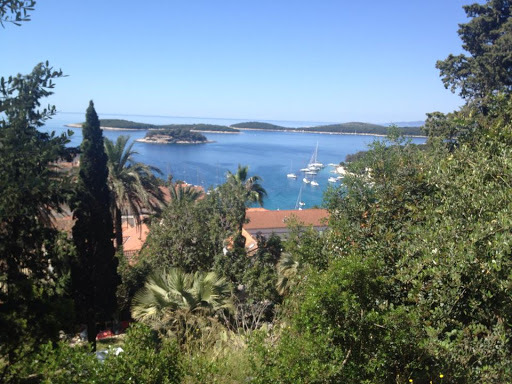 Hvar Island, to me, was the closest thing to paradise Europe has to offer. With its clear azure waters which would give the Caribbean a run for its money, and the amazing Yachts docked in the harbour, you could be in Cannes or Monte Carlo. Hvar also boasts one of the most beautiful sunsets I have ever seen. Each morning during my trip there I would walk to a little private cove I had discovered and dip my feet in the cool water taking in the views from the tiny surrounding islands and watching the ships come and go. On another morning I hiked to the peak of the island alone to an old derelict fortress and experience the views of the whole island. As I made my way up the side of the island, I greeted many other walkers, mainly couples and families and for the first time had a feeling that I was alone. I stopped at a few viewing points on the way and I got the feeling that I wished I had someone with me to share it with. I took a few pictures from the top and made my way down with a sense of achievement, but a slight disappointment that I had done this alone. India is not somewhere known particularly for romance. It is magical, spiritual, colourful, loud, hectic, but it is in places so naturally beautiful. Tordi Sagar is a rural village in Rajasthan, also known as the colourful state of India. After a fantastic day walking around the village getting to know the local people and playing with the children, a group of us took a camel cart ride up to the sand dune area. 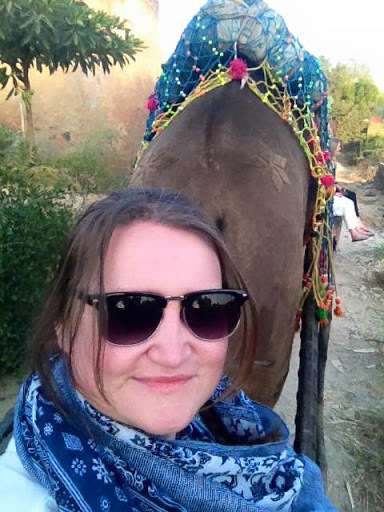 Riding on a cart pulled by a camel is not the romantic or glamorous part I assure you! It was bumpy and slow and I did feel at times terrified that I would fall off, but it was never-the-less a very interesting experience. We hiked up to the top of the sand dunes and cracked open a bottle of beer, then watched until the sun began to descend and the turned a beautiful shade of orange. I could feel the temperature dropping and the sand cool between my toes. In the distance you could hear the howl of wild coyotes. Once again I wished I could share this moment with someone special. 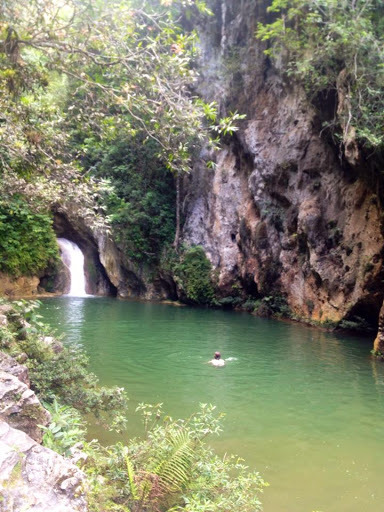 You may have read my blog post on Trinidad, Cuba and I have already explained how romantic this place was. 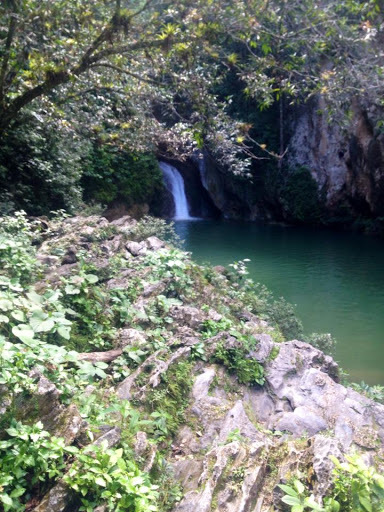 Sure it writes itself, the secluded waterfall, the butterflies, the exotic birds, and the cool clear water. I don’t even think I need to write anymore, the pictures say a thousand words. No disrespect to my travelling companion on this one, but this is a place for lovers! There are so many gorgeous and romantic cities in Europe but I have to admit Vienna for me was the most romantic. I may have forgotten to mention that I am a psychologist by trade and qualification, so the appeal of Vienna for me is a particularly nerdy one! 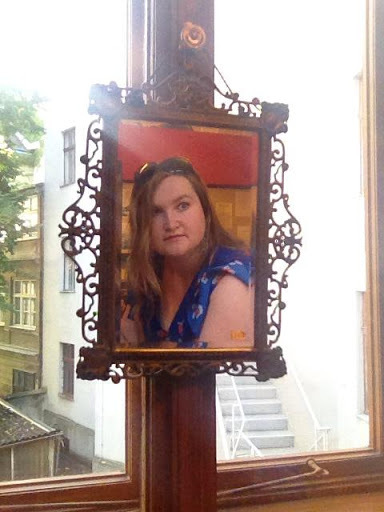 I was so excited to visit Sigmund Freud’s apartment and learn more about this interesting character. Now, Freud was actually a very cynical character, so love and romance would not be something he is associated with. So beyond the academic purpose of my visit, there are so many amazing things to do and see in Vienna. You can see couples taking horse carriage rides around the cobbled streets and the city is almost full of music with street performers playing classical versions of modern songs and the home places of composers such as Strauss and Mozart. 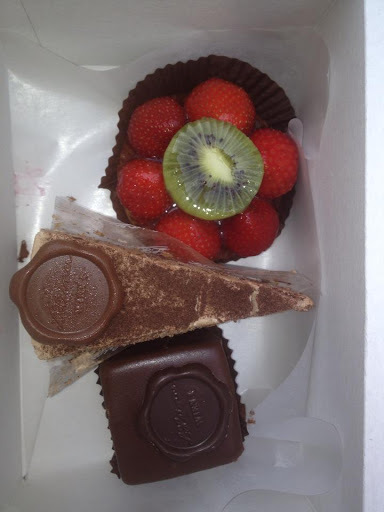 I was lucky to have a companion (non-romantic) on this trip and we indulged in the most mouth-watering cakes and attended an open-air performance of Giuseppe Verdi’s “La Traviata” opera. It may be a controversial choice but for me, forget your Paris or your Venice; Vienna is the place to be! Varanasi is one of India’s most spiritual cities and although they do not celebrate Christmas there, it was one of the most festive experiences I’ve ever had. I arrived in Varanasi on Christmas Eve morning after taking a 17 hour overnight train. It was scheduled to take only 14 hours, but was delayed by 3 hours on account of another train derailing during the night after hitting a cow. (Later I will tell you more about the madness of India in general!) As it happens, Christmas Eve 2015 coincided with the feast day of the Prophet Mohammad’s birthday. Walking through the streets of some of the Muslim parts on town, there was brightly coloured tinsel on every Side Street in metallic green and gold. Children were in their best clothes excited playing with kites and shouting greetings, some even saying “Merry Christmas” which seemed odd. Another coincidence was that Christmas Day in Varanasi was a full moon night. A full moon is particularly auspicious for Hindus and many fast on this day as they believe it restores the body and mind balance. The full moon on Christmas day was called Margashirsha Purnima. It was incredible that in one city, Muslims, Hindus and Christians were all celebrating feasts at the same time and I was overwhelmed by the respect each paid to the rituals of others. 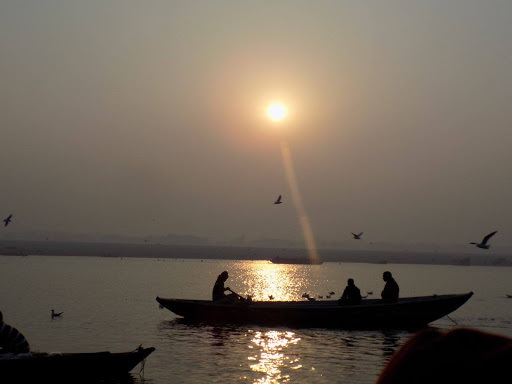 On Christmas morning with a group, I took a cruise on the Ganges. Locally known as Ganga, it is considered a holy river with thousands of Hindus coming every day to bathe in it. We boarded a tiny little boat and rowed out onto the peaceful river to watch the sun rise. 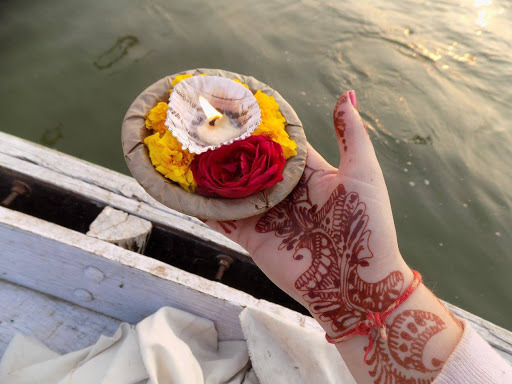 We purchased flowers and candles from a young boy on a boat even smaller than ours and made a wish offering it to the Ganga River. After this we fed some seagulls as the sun began to rise behind us. I sat on the boat wearing my little Santa hat and peacefully watching this new world go by and thought about someone I wished I had with me. A very very Happy Valentine’s Day to anyone who took the time to read this. I hope your World is filled with Love and if not be kind to yourself. Wow, you really cover a lot of ground. I love that you shared some of your Valentine woes. Maybe they should make cards for single folks to give to themselves!!! Keep traveling on. Oh my gosh that fiance card is def an epic valentine's day fail. I'd rather no card at all than that letdown! Good thing you're not with him anymore 😉 my hubby is serbian so he's visited Croatia and he absolutely loves it. And Vienna is one of the best places I've visited! How fun to travel the world. Very beautifully written. I especially loved the entry about Christmas spent in Varanasi and Hindus, Muslims and Christians were celebrating and yet respecting every ones faiths. It's beautiful to know that exists out there with all that is going on in the world these days. Thanks for sharing your experiences! I just hope the images were a little bigger. Huhu. I myself would want to visit places here in the Philippines by myself because I think it'll make change in me as a person and my perspective. 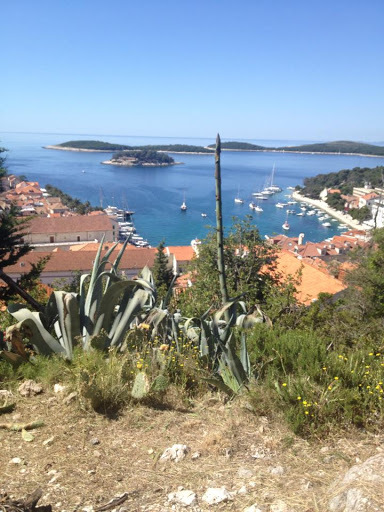 Awesome places, but Hvar is the best. I used to spend most of my summer vacations there when I was younger and I feel like I still haven't seen everything! We've become the someone special you shared these moments with. Thanks for opening up and sharing your beautiful pics! Love this! I'm married now but I feel like all the travel done beforehand helped me love myself first so I could find the right person! This is a great post, very raw and honest! Makes me thankful for both my solo travels in the past and my married ones in the future 🙂 Keep it up! PS. : The cake looks so yummi. Excellent blog post. I can definitely relate. I do believe these experiences are esy better than a Valentines filled with teddy bears and chocolate. Is true, sometimes you wished there was someone else, but at the end, they are so amazing that it doesnt even matter. My favorite of them all is Trinidad. I've never been there but judging from your Trinidad, Cuba post, it's sounds romantic. Wow these places look incredible! Thanks for sharing!! I get you. I love travelling alone, but there really are places better fit for lovers. Especially those that offer a lovely sunset view. 🙂 In the Philippines, two of the most romantic locations are El Nido and Coron in Palawan. 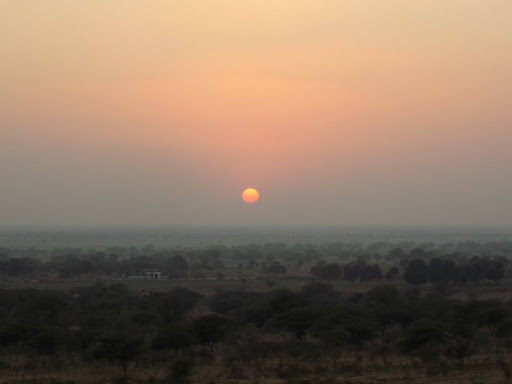 Do visit our country sometime! I've been single all my while but it was only lately, especially when I go somewhere romantic that I wish I was sharing it with someone. Nothing I can do about it though. A great parting advice bec. society is somehow rude to singles, blaming them indirectly for their loveless state. That story about the “To my Fiancée” card is the worst!! I would have hated him for it, but yeah, I guess after 8 years, it would be just funny. 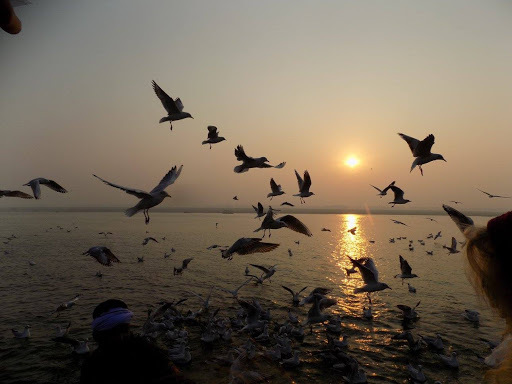 Also, your photo on the Ganga River is beautiful!! That's definitely one of those places that it would have been amazingly romantic, if you were with somebody. But that's okay!! Remember, we don't need anyone to be happy! Nice! Thaks for opening up. I like that experience rather than a Valentines with a teddy bears and chocolate and flowers. Yes, it's very good feeling of being with someone esp. on this kind of events but always remember that we don't need anyone to be happy(though Im married already). Sometimes it's okay to have that what we called ME TIME! On your story that your fiancée gave you the card that's left, I'll feel unimportant. And would have left him behind just to travel. Anyway, I've always desired to go to Croatia. I would like to see one of the most beautiful sunsets you've seen. 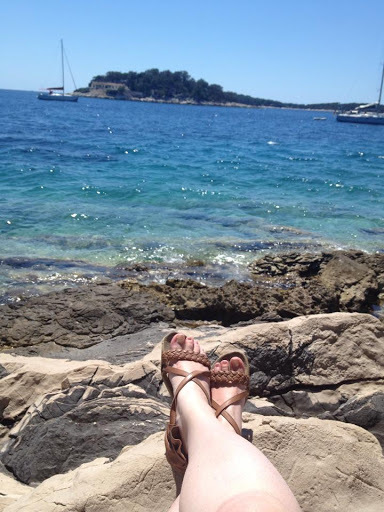 And also dip my feet in the cool water in Hvar. I don't think it's that bad to travel alone on Valentine's. Sometimes being with a significant other is an added expense. Cuba is definitely a place I want to visit and the pictures you have are stunning! I live in Vienna so I was so happy to see it included in the list and that you had a nice time when you were here, AND it was the most romantic. YAY! You mentioned mouth-watering cakes – Did you try the Sachertorte? Beautiful places! The perks of traveling alone you can enjoy every sight without someone asking you to hurry up haha! Your Mehendi is so pretty! Surely, traveling brings joy and satisfaction to the sojourner. No one's going to nag you that much so you can just practically stay and watch the sunset. All these places are really wonderful to go to.